Check out our RRLRAIA Area Alternate Recycling and Reuse Resources page and our RRLRAIA Area Single Stream Recycling Summary. 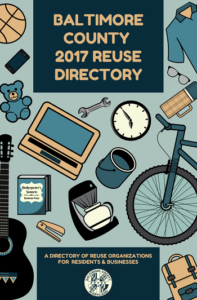 Baltimore County Reuse Directory lists organizations throughout greater Baltimore that accept various items and materials for reuse. Many of these are nonprofit organizations that provide donated resources to people in need, but the directory also lists businesses that buy specific items and even some companies that recycle materials the County doesn’t accept at its materials recovery facility. Some of the organizations listed will even pick up your unwanted stuff!